Because the cell voltage has quite a range during the discharge cycle, you have to factor in some safety buffer for fully charged cells and their higher voltage (e.g. 3 x Lipo can have 3 x 4.3 -> 12.9 and more when fully charged). You get full voltage and thus full 5 W power only at the beginning of the discharge cycle. DC-DC converters are one way of handling this, because they can convert DC voltages from low to high voltage (“boost converter”), high to low voltage (“buck converter”) or either way (“buck-boost converter”). The problem with such DC-DC converters is that they are prone to cause EMI due to their high switching frequencies and fast transients. Thus, many ham radio operators hesitate to use them near sensitive HF receivers. 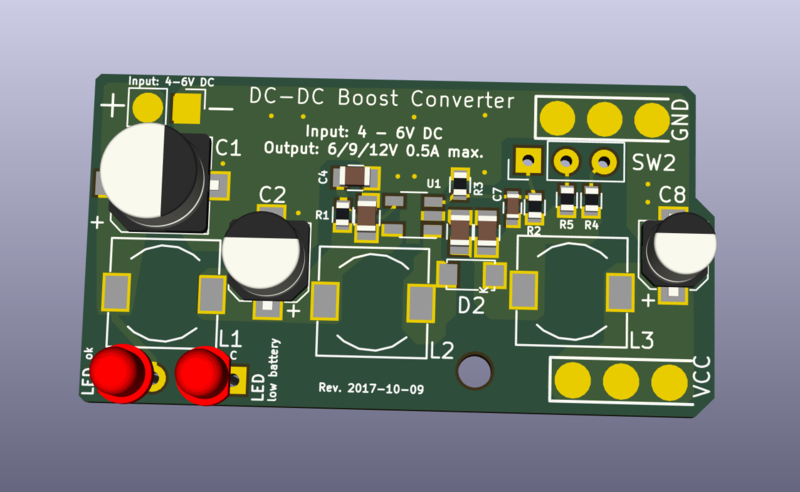 In order to solve that problem, I designed a DC-DC boost converter with highly effective input and output filters, specially targeted at QRP rigs like the MTR series. The output voltage is switchable to 6, 9 or 12 V, and the output current can be up to 500 mA, depending on the ratio of input to output voltage. This allows operating with 1, 2.5 and 5 W with a MTR or similar transceiver. It is meant to be used with either 4 NiMH cell packs (e.g. AA) or 2 LiPo cells. The circuit also contains a low battery indicator that can be configured to a warning at 3.9 (4 x NiMH) or 6.2 V (2 x LiPo). gobox-power - A 6-9-12V DC-DC boost converter for QRP rigs from 4 NiMH cells, e.g. Mountain Topper MTR-3B and MTR-5B. I assembled and tested a first prototype, and it works like a charm. Maybe you find this useful for your own projects. Nice work Martin. However, I’m slightly confused as the PCB states (twice) that the input Voltage range is 4-6 Volts but your LiPO low voltage warning is at 6.2 Volts. the reason that the PCB states an input voltage of 4 - 6 V is that I originally designed it for the use with four NiMH cells, and that the use with 2S LiPos is a mod I added to the design later on. The only actual constraints on the input voltage are that it must not be higher than the output voltage, because it is a step-up converter IC (Semtech SC4503, datasheet: http://www.semtech.com/images/datasheet/sc4503.pdf). The only thing that happens if the input voltage is higher or very close to the output voltage is that the output voltage will become unstable, because the regulator will try to use a pulse-width that is smaller than technically possible. Thus, when used with a 2S Lipo configuration, one has to omit the 6V option (which I found handy for 1 W operation, mainly for tuning the Elecraft T1 with minimal load on the final transistors of the rig). Today, I compared the input and output ripple and noise of the new design with a standard Pololu DC-DC converter, which uses the exact same IC (and which I have built into my previous GoBoxes). Attached, please find the measurements. One can see that the ripple and noise at the output is almost 25 times (280 mVpp vs. 11.2mVpp), i.e. 14 dB higher than with my new design with filters. It might actually be even better, since I suspect that the remaining noise in my measurement might have been rather EMI from my lab environment. On the input, the effect is a bit lesser with 180 mVpp vs 66 mVpp (4.3 dB). The exact effect will depend on the internal resistance of the supplying battery and other factors. Very sensitive components (e.g. 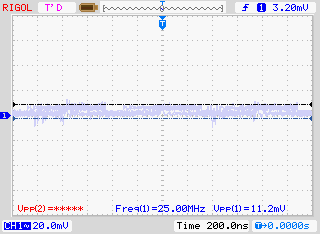 AF amplifiers) are better connected to the output of this (and mostly: any) DC-DC converter, even if that requires an additional LDO to reduce the voltage again. But one can sum up that the extra effort for the input and output filters makes sense. I have been asked in private whether this DC-DC converter is actually suitable for an MTR-3B and MTR-5B, because those draw ca. 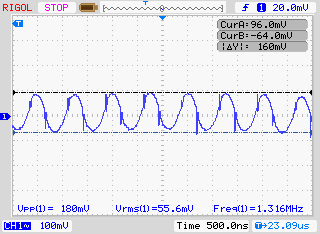 560 mA at 5 W, and the PCB says the maximum load was 500 mA. Short answer: Yes, no problem, both with 4 x AA NiMH cells and 2S Lipo cells. Long answer: First of all, the critical value is not the output current, but the input current, which roughly depends on the ratio of output vs input voltage times the output current, minus the conversion losses. If the switch current exceeds 1.9A (the typical current-limit), then the current-limit comparator will set the latch and turn off the power transistor. The IC will heat up a bit. Should the temperature exceed 155 °C, there will be a thermal shutdown. Once the chip will have cooled down by 10 °C, it will resume operation. So in worst case, the circuit will shutdown if it gets too hot, but in nine months of operating on a daily basis with this set-up, I have never experienced problems. Most NiMH cells stay above 1.2 - 1.1 V per cell for the biggest part of their discharge cycle, so a 4 cell block will have more than 4.4 V almost all of the time. Here is a computation of the maximum output current you can draw in the 12V setting. The first value is for the very conservative 1.4A limit, the second for the typical 1.9 A input current limit. Up to ca. 4.4 V, it is safe to draw 600mA (in particular if the duty cycle is only 50% as in a CW rig). Below that, you should switch to 9V / 2.5W. 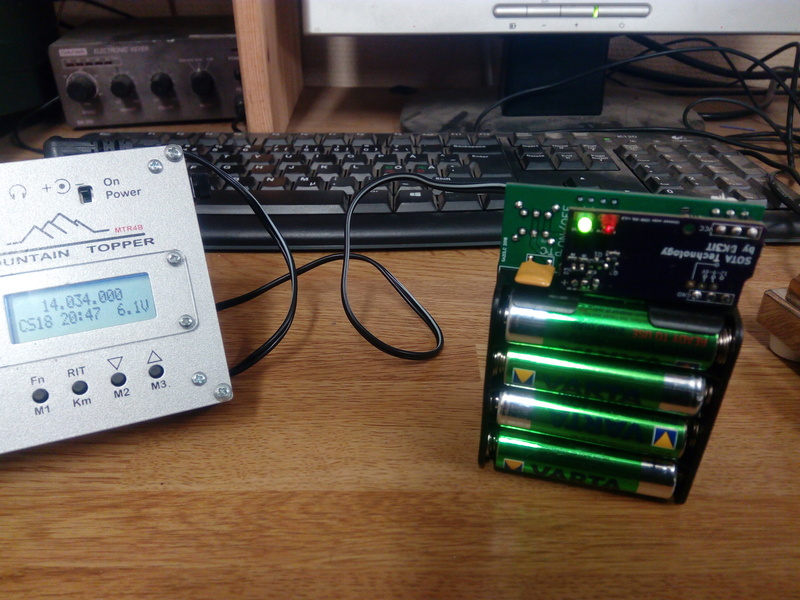 A 2S Lipo configuration can provide up to 0.6764A (very conservative) / 0.9180A (typical) at the cell voltage of 3.1V, which is when you should stop discharging the cell anyway. This is wonderful! I was just beginning to think I might try filtering a commercial buck-boost module, but now I think I might build this. Thanks! Exactly what I have been looking for to my MTR4B. I saw you are also working on a battery upgrade for the rtc, would be interesting to know how things are coming along with that. as for the RTC buffer, I now use a 2 x AAAA (not AAA!) 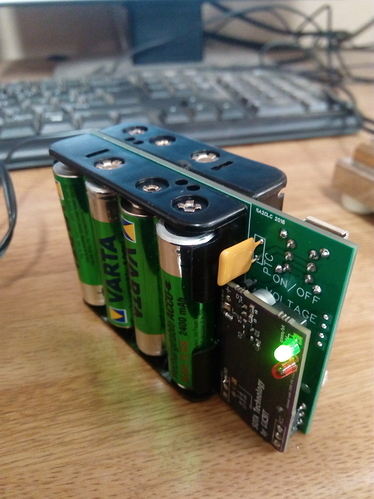 battery holder from Digikey and two AAAA cells. It was a bit of a challenge to unsolder the coin-cell holder, but I managed it. 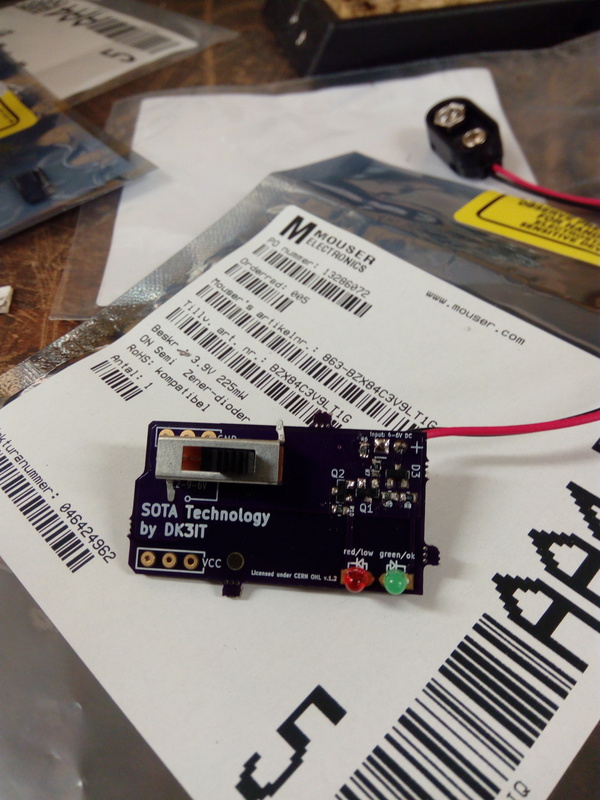 The AAAA holder is then fixed to the PCB with double-sided adhesive tape. Works like a charm, and it is really nice to have the UTC time directly on the display. Attached, please find a picture of both the DC-DC converter and the RTC buffer battery modification in my new GoBox design. One thing that time will tell, though, is if the AAAA batteries can provide enough peak current when it is really cold. Steve Webber explained, if I am not mistaken, that the problem with the coin cells was that they could not handle such peaks during the power-on process, which led to the CPU ending up in an undefined state. If such was an issue, I would add a tiny reset switch. If you are considering to build this one, you might want to wait 1 - 2 weeks: I am evaluating whether a well-known player in the field could produce a kit or complete product of this; this might save you money and hassle, as some of the very specific parts are difficult and expensive to get in small quantities. Will share information once available! 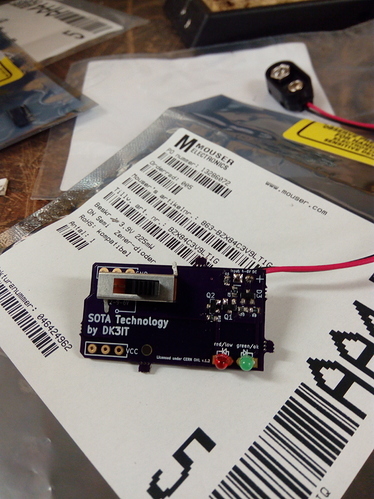 Well, I ordered the pcb from OSHpark and components from mouser. Soldered it tonight and it seems to be working fb. Added a slide switch onboard the pcb to choose “power level”, and now I’m trying to figure out where, how and and when to incorporate it to my battery pack or rig. I have the MTR4B, which is built in quite a big aluminum box, which could hold the pcb whitout issues. The unpleasant thing would be to drill the side of the case (really not a big deal if I take my time to measure properly), and to modify the on/off button. Congrats to the successful assembly! The simplest solution is to connect it to the DC input jack of the MTR PCBs. 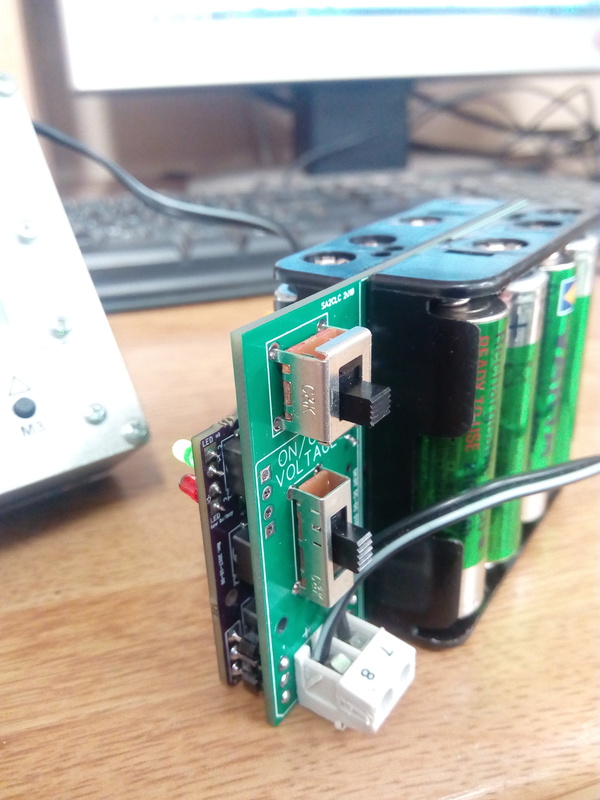 in this case, you need a second on/off switch, because you have to disconnect the battery from the converter, and the original power switch will only disconnect the rig from the converter output. This option can be put into the MTR case (but needs good insulation, like large heat–shrink tube). If you want to reuse the internal on/off switch, you need to unsolder the transistor from the MTR polarity protection (Q5 in the case of the MTR3, not sure about the identifier in the other variants), and add a wire to the input of the converter from its larger solder pad, and another wire to the large pin of the SOT case from the output of the converter. This is a tricky mod, I can post pictures when back from my current trip. 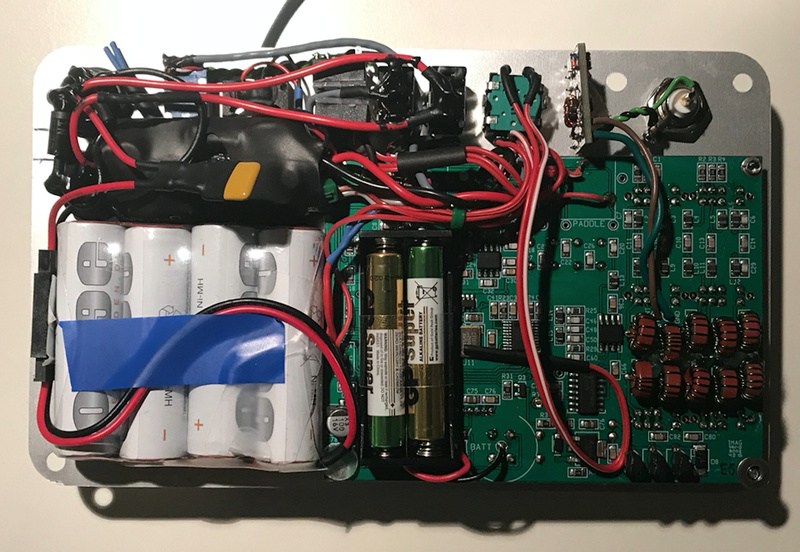 I am not sure of the power rating of the transistor and the MTR switch, so to be on the safe side, it is best to use this option only when using 2S Lipo batteries, not 4 NiMH, because the input current may exceed 1A in the latter case. Note that for the 2S Lipo configuration, you have to replace the Zener diode by a 6.2 V type and increase the LED resistors from 220 to 470 Ohms. As for the mounting of the voltage switch and LEDs, I typically use short wires (but be careful not to catch stray RF, so mindful routing and maybe twist them). As for the plan of a kit: This has turned out to be economically infeasible. The best option seems to be a bundle order of the parts with fellow hams. Went ahead and designed a “battery board” to go with your step up regulator pcb. Very happy with how it turned out. Have 4 spares if anyone is interested. It’s quite universal. You can choose between 1 or 2 banks of batteries when building the pack. It also lets you choose which side to mount the step-up pcb on, and of course the switches. The leds can also be brought out on the “battery board pcb”.